There is a serious connection between olive oil and heart health. We all know olive oil is good for hair and the skin. But it is good for the heart as well. One of the major health benefits of olive oil is it gives protection against heart diseases. It lowers the risk of developing coronary heart disease almost in half. Regular intake of olive oil is excellent for keeping the heart healthy. Olive is a great source of monounsaturated fats. In addition, it contains lots of antioxidants including chlorophyll and Vitamin E. Olive oil also contains a chemical compound called oleuropein. Oleuropein can be found in olive leaves. All these compounds, especially oleuropein prevents LDL cholesterol or bad cholesterol from oxidizing. When oxidized cholesterol sticks to the artery walls and forms plaques, it leads to heart attack and stroke. This condition is called atherosclerosis. All the phytochemicals present in the olive oil including oleuropein are helpful in the prevention of atherosclerosis. Olive oil also prevents the production of two oxidants that are responsible for damaging LDL cholesterol. Damaged LDL cholesterol decreases the number of glutathione. Thus, they protect glutathione – a powerful antioxidant, which is very important to fight against free radicals. It should be noted that processed olive oil such as ‘pure olive oil’, ‘light olive oil’ and ‘pomace oil’ is excluded from these claims as the chemical solvent extraction of olive oil from the dregs of olive processing removes almost all chemicals other than the oil itself. These include the very substances that are considered to confer many of the health benefits claimed. They predominantly include phenols (polyphenols) and tocopherols (including Vitamin E). Monounsaturated acids (MUFAs) in olive oil are a healthy dietary fat. MUFAs lower the risk of heart disease by lowering total cholesterol and low-density lipoprotein cholesterol levels. Monounsaturated fatty acids are also help to normalize blood clotting. 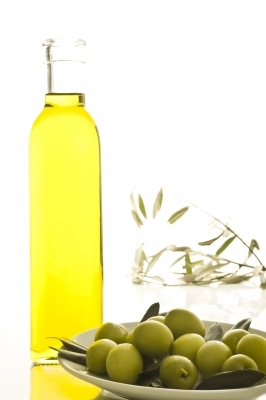 Mediterranean Diet studies have long associated olive oil intake with decreased risk of heart disease. However, a recent group of studies has provided us with a fascinating explanation of olive oil's cardioprotective effect. One of the key polyphenols in olive oil - hydroxytyrosol (HT) - helps protect the cells that line our blood vessels from being damaged by overly reactive oxygen molecules. HT helps protect the blood vessel cells by triggering changes at a genetic level. The genetic changes triggered by HT help the blood vessel cells to enhance their antioxidant defense system. In other words, olive oil supports our blood vessels not only by providing antioxidants like like vitamin E and beta-carotene. Olive oil also provides our blood vessels with unique molecules like HT that actually work at a genetic level to help the cellular walls of the blood vessels remain strong. Extra virgin olive oil is the best choice for the heart as it contains more polyphenols than refined oil. It is the best source of polyphenols and other plant compounds, followed by virgin olive oil, olive oil.